Evergreens are published at a different fixed time, why? Web Push notifications for Joomla! Why modified articles, in published state, are not processed? There are requests in the list, waiting to be published, but they are not delivered, why? "Immediate" posts are not published immediately, why? Images with spaces in the filename are not shown on social networks, why? I have enabled Cron job mode, posts are 'Waiting' but not delivered, why? Wrong character encoding, characters of the intro text are wrong in a published Post, why? Why are social posts not published? When a Tweet is published and I click on the link, the login page is returned! Why? Post are delivered with a shortened URL, but link does not target the right item, why? Operation timed out after 10000 milliseconds with 0 bytes received. Articles from RSS feeds are not detected, why? The System Check is showing a red timestamp difference, why? The System Check is showing a red Timestamp difference (998), why? The System Check is showing a red Timestamp difference (999), why? Live Update shows this error "SSL certificate problem, verify that the CA cert is OK"
Tried to upgrade from old version N, now it does not work anymore, why? What can I do? Cron created but no processing, why? Executing in Cron job mode, posts have this domain-error-running-as-cronjob.com/home/... URL, why? My system shows a Blank White Page. What should I do? Error "Couldn't resolve host", what does it mean? There is a difference in server time. How do I fix this? # Why modified articles, in published state, are not processed? By default, AutoTweetNG only processes new content items. 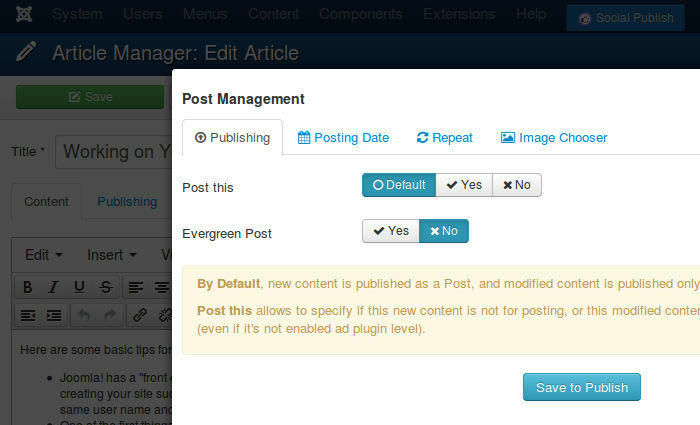 Content modification can be enabled at plugin level to be received. For example, if articles are initially created as unpublished and, in a second instance, modified to be published, then they are not processed. To enabled article modifications, in System - AutotweetContent plugin, Posting filter/Process modifications=Yes. This setting is a general method to publish all content modifications. When Process modifications is enabled, every time you save, a new 'modified' event is fired and a new request is added in a 60-seconds window. You can increase this window to add a delay, deliver fewer requests and sum all changes in a single request (Options/Advanced/Content Polling/Minimum requests polling delay). On the other hand, Joocial has an interactive tool Post manager to choose when an article has to be pushed (Post This=Yes) into the publishing queue (or not, Post This=No). Ref: How content can be republished? # There are requests in the list, waiting to be published, but they are not delivered, why? AutoTweet and Joocial are designed to avoid any overload on your website while it processes social posts. Hence, there is always a delayed publication, caused by Social Channel API processing times. By default, in Page Load mode, only when front pages are visited, Requests and Posts are processed by the Automator plugin (every 2-3 minutes). CRON job task (available only in AutoTweetNG PRO and Joocial). Running in Automator Plugin mode (default), posts are only processed when the front website is visited. If your site does not have visits on the front site, AutoTweet does not process waiting requests and posts. On the other hand, you can manually click Process for Requests or Publish for Posts to publish them, or schedule a CRON job task to work in fixed intervals. AutoTweet detects new articles even if they are inserted from others third-party extensions. However, since AutoTweet checks the database applying time filters, new articles have to be published within a certain date range. If the articles are not detected, please, try to increase the polling window to include a bigger date range. You can find the Polling window (hours) parameter in: Control Panel / Options / Advanced settings / Content Polling Settings / Polling window (hours). After you change the parameter, it is going to retrieve the articles, within the new polling window, in the next check. # Evergreens are published at a different fixed time, why? If the time difference is the same, then your hosting could have time zone misconfiguration. Please, verify if each setting matches your Joomla! configuration and ask your hosting provider to update PHP Information. # "Immediate" posts are not published immediately, why? In Joocial, Post This "Immediately" defines a request and a following post with the highest priority to be processed in the first place. Once a request is received, it follows the same steps of the general workflow. For example, to apply all rules and deliver the posts to all (unlimited) channels. The publishing process can be long and "Immediately" can be translated to several processing steps according to your configuration. To deliver "Immediate" posts faster, you can increase the Cron job frequency or increase the number of processed posts in each execution (Options/ Cron job/ Max. no. of posts). # Images with spaces in the filename are not shown on social networks, why? It is not recommended to define URLs with spaces. A local file can have spaces. However, a valid URL encodes space with %20 or +. Both cases are accepted in different ways in each social network, browser and device. In the end, it is better to avoid them. For instance, an article title is always translated to a slug with - instead of spaces. The same practice has to be applied to image filenames. # I have enabled Cron job mode, posts are 'Waiting' but not delivered, why? There are several alternative execution methods . Please, check which method works in your hosting, review hosting documentation or ask to your hosting support which method is available. To check if Cron job command is executing, you can enable the logging mode and look for periodic executions. If they are missing, not matching your Cron job frequency definition, then it is not executing at all. # Wrong character encoding, characters of the intro text are wrong in a published Post, why? AutoTweeNG and Joocial are fully compatible with UTF8 and non-latin characters. Many users work with languages such as Greek, Russian, Chinese, among others. However, PHP and MySQL UTF8 support have improved on the latest versions. Wrong character encoding is usually associated with a legacy PHP version. Most issues are associated with PHP 5.3. What is your PHP version? Please, update to the latest PHP stable version. At this time, PHP 5.5 or superior. PHP 5.6 is the version currently packaged in most server distributions. # Why are social posts not published? See There are requests on the list, waiting to be published, but they are not delivered, why? # When a Tweet is published and I click on the link, the login page is returned! Why? Check if the article, category and menu are set to public access. If not, the user has to login to read the article. Alternatively, if there is more than one menu access path, the SEF router may be choosing the restricted access. In this case, review your extension configuration or re-organize the alternative accesses to route the traffic to the right menu. # Post are delivered with a shortened URL, but link does not target the right item, why? AutoTweet and Joocial generate Posts in the backend. Since front-end and back-end sites are different sites, a connection is opened from back-end site to the front-end site to solve the SEF query and generate the link. If there is any issue in the SEF query, then the resulting shortened URL may be different than the real link. To investigate the case, please, enable the logging mode , test a case and send us the resulting logged file to check it. # Operation timed out after 10000 milliseconds with 0 bytes received. This is an issue at server level. The server has not temporally been able to open a connection to the social network servers for more than 10 seconds. You can just wait until the issue resolves itself. Sometimes, network issues are caused by traffic congestion, even beyond your hosting provider control. Otherwise, please, ask your hosting support if there is any connection problem. # How can I auto-publish to my user profile in Facebook? Facebook has deprecated user channels from the API. So, there is no longer a way to auto-publish posts to user profiles via a User Channel. To share a link, Facebook is currently enforcing the use of sharing buttons to manually share posts and links into the user profile. # The Facebook Login button is not shown to autorize the App, why? The Facebook Login button is shown on the page when Facebook SDK is properly initialized in the page. Another extension on the site has already initialized Facebook SDK with a different scope. Try to temporarily disable other extensions that also has Facebook Apps to confirm if there is a conflict between them. After the authorization, you can re-enable them. A security extension, a CDN service or a security service is blocking Facebook Login. For instance, Cloudflare or Kaspersky Total Security are known to restrict the SDK. After the Facebook–Cambridge Analytica data scandal , Facebook has started to implement drastic changes to the platform. There have been overnight breaking changes in a short period. Now, after the F8 event, with the release of Graph API v3 and the opening of the new App Review process, we can consider that most of the new model is ready and we can start rolling out the news to our software packages. We have released AutoTweet and Joocial 8.20 versions to support Facebook new API. This is the first step to work with the new workflow. The current Facebook channels and Apps (v2. *) do not require changes. New: Facebook Pages channel works now on the new permissions "publish_pages, manage_pages". Pending: Facebook Groups channel works now on the new permissions "Group API". Deprecated: Facebook User and Facebook Photo channels, Facebook has deprecated the ability (publish_actions permission) to publish posts to user profiles. In all cases, Facebook requires declaring the ownership of Pages and the associated domains . Please, plan with time the creation of a site, a Facebook page and the App Review to create a new channel. The current Facebook channels and Apps do not require changes. If you have an App with v2. *, then you can fully authorise your Pages channel. If you have an App on v3 (or superior), or you are approving a Groups channel, then your App must be submitted for App Review . In the meantime, you can start testing with a Test App. AutoTweet and Joocial 8.20 are available now, compatible with the new permission model; they can be downloaded here . At this time, we are working on a new tutorial about the new App Review process. The auditory requires to grant access to Facebook to your site and record a screencast to document why you request them the permissions. It is not clear if this is going to be the final procedure once they complete the platform changes. # Which is the API version of my app? On November 7, 2017, Facebook released API 2.11, including a restriction to publish only URLs from validated domains. The posts can be published only from the authors who own a Page and an associated domain. No post will be published unless it is published by the team associated with Page, Domain and App. To know more about the steps to claim the ownership of a domain, please, visit our Facebook Link Ownership Guide . # Facebook shows the wrong image, why? REF: Facebook shows the wrong description, why? UPDATE: On July 18th, 2017, Facebook changed how the post fields are loaded. Since this date, when you share a link with Facebook API, the value of picture, name, caption, thumbnail, description is taken ONLY from the OpenGraph Tags . This change has already been reported as a bug, for more information: On sharing a URL the picture, name, caption, thumbnail and description set manually is ignored . At this time, it is strongly recommended implementing OpenGraph Tags. At this time, Facebook ignores the image that AutoTweet defines in the API call and loads the image and other fields directly from the link. Facebook reads OpenGraph Tags and uses these tags to retrieve the page information. 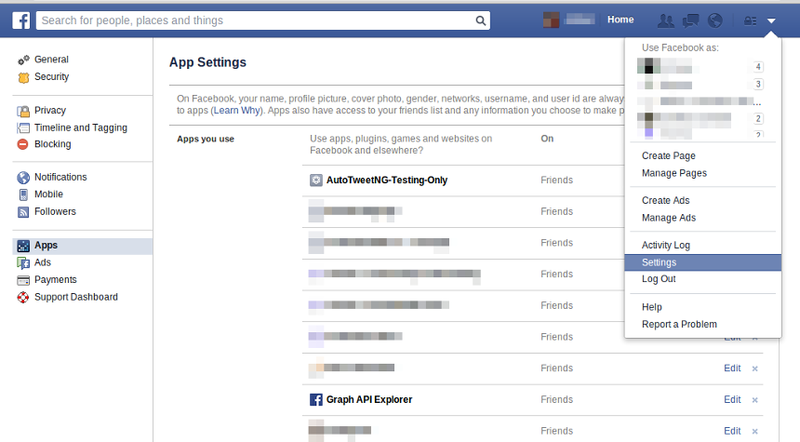 To guide Facebook in the choice of the image, we recommend installing and configuring AutoTweet NG OpenGraph Tags plugin. The latest version of the plugin comen with the Smart Generator to generate exactly the righ tags for each link associated with a processed post. If it is not the image that you expect, it could be the image defined as default image in the general Options configuration. If Facebook is not able to load the specified Post image, it loads alternative images or a blank rectangle. For instance, a customer has restricted external images access in the internal pages of the site and only allowed access to the Home images. Then, Facebook has detected images from the Home page and included one of them in the Post. Images must be bigger than 200x200px. These are the recommended image sizes: Facebook Layouts Guide, how to publish Big Pictures . For instance, test with this sample image (https://via.placeholder.com/720x375). For maximum compatibility, remember to use only alphanumeric characters in the file name. Spaces and special characters are frequently a source of problems. As a reference, Facebook Sharing Debugger output for an image must show the image like this one: https://developers.facebook.com/tools/debug/sharing/?q=http%3A%2F%2Fvia.placeholder.com%2F720x405 . If your test does not show the image in the Link Preview, then Facebook cannot load it. In some way, it is being blocked. You can verify any URL, or an image, and get results about how Facebook scrapes your site. It should always get a Response Code 20x and show a Link Preview. If you have added additional restrictions to htaccess or robots.txt, please, try to restore the original Joomla htaccess and robots.txt. If the problem remains, ask to your hosting provider what can be happening (mod_security?). REF: What are Facebook's "OpenGraph Tags"? REF: What is "AutoTweet NG OpenGraph Tags plugin" for? If you are sharing requests to the page between several tools or apps, then it could be hitting the limit. In any case, we recommend to start checking your Apps following the Facebook Channel Re-Authorization Procedure . 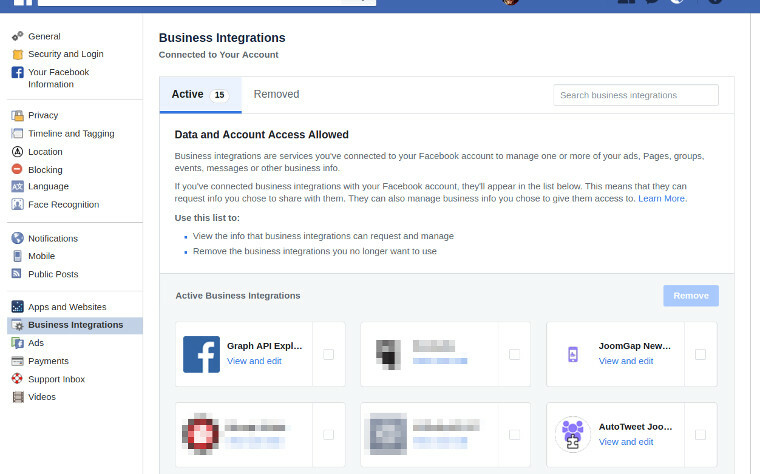 Log in to your Facebook Account and remove the App from your Account: Account Settings / Apps and Websites or Business Integrations. Logout from Facebook. Close your Browser (to finish the session and clear the session cache). Alternatively, you can open a New Private/Incognito Window. Login to Facebook and check that the App is no longer associated with your user account in the Account Settings. Log in to your Joomla! Backend and authorize the channel as shown in this tutorial . Q: I discovered that none of the posts from autotweet were showing up or visible on my Facebook page unless I was logged in as admin. Which is the problem? A: If Your Own Facebook App is in development mode, only App developers can read the posts. Please, enable it to Live mode. Click on the Apps menu on the top bar. Select the particular app from the drop down. Go to 'Status & Review' from the table on the left side of the page. Do you want to make this app and all its live features available to the general public? - Select switch to set YES/NO value. Reference: StackOverflow: The developers of this app have not set up this app properly for Facebook Login? # I've tested everything with my user, now it does not work on the Live Account, why? Facebook has reorganized the development workflow to clarify use cases. This step has added new permissions and the way to work and publish content. Facebook has greatly improved to manage administrators, developers and testers. In Joomla!, you create an AutoTweet channel, associating the Facebook App and Facebook Page as the content target. The authorization is granted by the same Facebook user. In the current Facebook user management model, you cannot have separate users for development or production. Now, it is possible to define a development Team in the "Roles" area and testing-specific Apps for your main App. You can manage users and roles, and also define a testing sub-application. There are other Facebook use cases, besides content publishing, where regular users (not members of your team) can authorize an App with extended permissions. These cases require a Facebook audit and approval. To sum up, all your users have to be defined under the App "Roles" to define a team (for example your account as an owner is an administrator) and your testing has to be done with a "Test App". Finally, if you have a multi-vendor site or community auto-posting site (where you do not know your users, they are just registered users - certainly not in your Facebook contacts - ), then you have to apply for Facebook audit and comply with their requirements. # Posts do not show comments, only manager and author can read it, why? Facebook has updated its Comment Ranking. Please, disable in your Page Settings/General/Comment Ranking/See most relevant comments by default. Given URL is not allowed by the Application configuration: One or more of the given URLs is not allowed by the App's settings. It must match the Website URL, or the domain must be a subdomain of one of the App's domains. Please, review you App Configuration . Fill the App Domain to exactly match your site (www or https do matter). If there is any mismatch, it is a different domain. Besides, if you have enabled Settings / Migrations / Stream post URL security: Links in stream posts must go to app's Canvas or Website URL. Facebook Groups posts have stricter requirements than regular posts. Posts links must match your App domains defined in the Facebook App. To solve it, you can simply configure your Website URL in Facebook App. 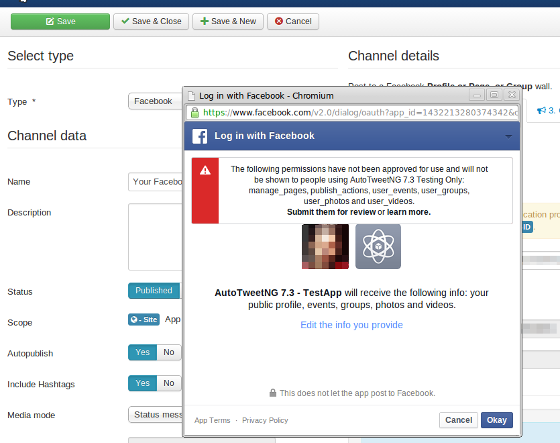 Alternatively, please, verify if your Facebook App has Stream post URL security (Settings / Migrations) enabled. With this restriction, links in stream posts must go to app's Canvas or Website URL in all cases. The following permissions have not been approved for use and will not be shown to people using APP NAME: manage_pages, publish_actions, user_events, user_groups, user_photos and user_videos. Submit them for review or learn more. There's a reason..... Yes, Facebook has launched a new API version a.k.a Facebook API Version 2.0 (Facebook Platform Upgrade Guide ). After this change, the authorization window show this alert to warn final users. Since you are authorizing this app as a member of the App management team, you can proceed with authorization as usual. If you plan to allow other users to authorize the App, then you must join your Facebook friends as new members of the app development team, or (if the users are not your Friends) ask for a Facebook review to validate your use case. Facebook has detected an issue on your submitted content. Additionally, you can check your website versus a URI Blacklist database, like https://www.uribl.com/ . If you are on a shared hosting platform, your supplier may be hosting an unsavory character along with you. If your host is on this list, the easiest thing to do is to move to a more reputable host. In some sites, we have found this odd Twitter error code. In some way related to an issue on image upload and a Twitter API bug. We have implemented and released a workaround. To enable the workaround, please, activate it in Control Panel, Options / Advanced / Channel Debugging - Alternative Image Load = YES and process the messages again. # 226 - This request looks like it might be automated. Twitter App is sending the same Tweet multiple times to several timelines. Twitter suspects the account or hosting is possibly compromised. Twitter spam filters may be just rejecting the content itself. Please, try to reduce the number of Tweets, the target channels, or change the message format for each channel. If you are not particularly flooding your timeline with test tweets, then someone in your neighborhood (in the same hosting or IP) might be a spammer. In this case, Twitter has banned the whole server and there is not much else to do. We constantly monitor and adjust our filters to block spam and malicious activity on the Twitter platform. These systems are tuned in real-time. If you get this response, our systems have flagged the Tweet or DM as possibly fitting this profile. If you feel that the Tweet or DM you attempted to create was flagged in error, please report the details around that to us by filing a ticket at https://support.twitter.com/forms. Filing a ticket at the above URL is the best course of action to resolve any false positives we may be seeing in these detection efforts. # Couldn't resolve host 'api.twitter.com'. Your server is unable to find Twitter API server. This is related to a network issue. Please, check with your server support if this a general server issue, or it was a temporary problem. If your hosting provider is having problems with the DNS service, then it can be intermittent. To retry a request, in the Requests list, you can move the Request back to Processed=No, and wait until the next execution to check. In Posts list, you can filter for the specific channel posts and Status=Error, then you can move them back to "Pending" (for manual approval) or "Waiting" (for Cronjob processing). Twitter does not accept images bigger than 1MB, and rejects them with this error. Please, submit only tweets with images smaller than 1MB. Telegram has recently modified the procedure to authorize a Bot to publish into a Channel. Now, it is required to add the bot as a member and administrator to the channel. There will be no bots in the contact list, so you need to search for it. Clicking on it, you make it as administrator. By default, LinkedIn only authorizes post publishing to personal profiles. LinkedIn now requires an organisation review to approve apps for company page publishing. For more information: LinkedIn Marketing Developer Program . If you have not requested the review, then you can only create linkedin personal channels. # Invalid redirect_uri. This value must match a URL registered with the API Key, why? The error is caused by any difference or an uninitialized Authorized Redirection URLs field. Have you added all of your URLs in the list of URLs permanently? # 401 - Unable to verify access token. I got this today, before everything worked, why? 401 - [unauthorized]. Expired access token. By default, LinkedIn Tokens has a duration of 2 months. Additionally, if you change your password, or other software is using the same App, then the token can expire before 2 months. In some cases, we find that if you access your LinkedIn account frequently, then the token never expires. This is not a written rule, only a finding of our work for some projects. Please, proceed to reauthorize your LinkedIn channel. # I cannot authorize, I got "Invalid Redirect URI", why? Your Authorized Redirect URL must be permanently added to the list and match your site. # I can't authorize the channel. Error: Could not get access token. When you authorize the channel and give your approval in LinkedIn, the social networks sends a temporary code to your site. In the second leg of the authorization, the temporary code is exchanged to the final access token by Joocial. If the extension cannot open a connection to LinkedIn servers, then this error is received: Error: Could not get access token. Please, ask to your hosting provider is there is any security restriction to call https://api.linkedin.com . LinkedIn is not accepting more activities from your account. Please, try to reduce your activity to avoid this error, every connected App consumes API calls. You do NOT have to write anything and Any referer allowed in the fields, you have to clear these fields, removing any entered value. The domain must be exactly the same back-end URL. www... does matter, if there is a minor difference, even just www, it is a whole different security domain. Additionally, check if you have copy-pasted additional spaces, for instance in the Client Secret field. Ref: Google Blogger - What are the steps to authorize the channel? # When I try to authorize the Google Channel, I receive a "redirect_uri_mismatch" error, why? Please, delete the channel, remove the App from your authorized Apps (https://plus.google.com/u/0/apps ), access your site with a different browser (or with a Private Tab), recreate the channel and try to authorize it again. AutoTweet includes a component, modules, core plugins, and optional plugins. AutoTweet component, modules, and core plugins are updated by Joomla! Extensions installer. But, AutoTweet optional plugins, which are manually installed, must also be manually updated following the same procedure. After an AutoTweet update, please, verify if you have installed the latest version of the optional plugins. You can find them in the same AutoTweet version package UNZIPME-autotweetng-.....zip. You can also check the latest versions in AutoTweet / System Check, or in the Compatibility Chart for AutoTweetNG and Joocial . Plugin: Is the plugin activated? Have you enabled any plugin filter? Please, try to disable them just to check. Request: are they processed? Are they waiting? Q: There are requests on the list, waiting to be published, but they are not delivered, why? Rules: Have you created rules? Please, try to disable them just to check if they are affecting the processing. Posts: are they published into the channel? If these basic tips do not solve the issue, please try to enable the logging mode to inspect the internal processing. In any case, if you cannot solve the case, please, send us the logged file to our support service to review it. Error message: "loading" or "Requesting channel data"
The channel manager loads the channel type sub-form with an Ajax query to your back-end site. If the form cannot be retrieve, the "loading" message is not replaced by the right sub-form. Directory Permissions, check if Joomla! directory permissions are Writable (System/System Information/Directory Permissions). Particularly, media/lib_extly/tmp directory. HTML errors, your site does not have a valid HTML body structure. Please, try to locate the source of the invalid HTML page. Security restrictions, if there is a restriction to back-end Ajax queries, then connections are not going to be successfully completed. For example, mod_security can disable this queries, please, try to disable mod_security or any other security mechanism temporarily. This is an issue at server level. The server cannot connect to the social network servers. For example, api.linkedin.com. Please, ask your hosting for support if there is any connection problem to LinkedIn servers api.linkedin.com. Additionally, it could be a transitory problem. Some hosting providers do not even warn users when they implement changes or have network outages. Please, wait 1 hour and manually try to publish the post again (or monitor if the issue solves by itself in the next posts). This is also an issue at server level. The server cannot send and receive data connected to the social network servers. For instance, your hosting provider is specifically blocking inbound communication to api.twitter.com. Please, ask your hosting for support if there is any connection problem/restriction to Twitter servers api.twitter.com. Q: Channel name is a mandatory field, However, even if you fill the name, this error is reported. Why? A: When you try to create a channel, you fill the channel name, BUT when you save it, you get The channel requires a name message. Diagnose: There is an issue in your server configuration, related with the database setup. For instance, in a Windows server 2008 with a MySQL v5.1, a customer reported that a difference in the database prefix caused this error. The database prefix in the Joomla! config file was in uppercase, and the actual database prefix was in lowercase. Alternatively, you had an old AutoTweetNG installation, but the update to the latest version failed to change the tables. # Articles from RSS feeds are not detected, why? Q: I have an extension that imports articles from RSS feeds, but AutoTweet does not see those posts. Is there a way to make it so autotweetng will post all new articles regardless of how they are created on the site? A: AutoTweet detects the new articles, but they have to be published and within a certain date range. Are you importing articles with the today's date or older articles? Please, try to adjust the Polling window (hours) to load older articles (Control Panel / Options / Advanced Settings / Content Polling Settings / Polling window ), by default it is defined as 24 hours window. This error is found when the RSS library cannot process and parse the Feed type. Please, double check the RSS Url, or try to load it with a different RSS reader. If you are sure that the RSS Url is fine, you know what the source site is generating it with Joomla and the site has Admin Tools, please, disable Malicious User Agent block (MUAShield). (WAF / Active Request Filtering). More info about the issue, #26809 – MUA Shield blocking Simple Pie requests . # The System Check is showing a red timestamp difference, why? A timestamp difference signals that your server clock is not updated. Facebook, Twitter, etc are not going to accept your server-side OAuth authentication. Please, check with your hosting provider to update the server clock. In System Check, if the timestamp difference is a small, less than 10 seconds, then it should not affect the OAuth authentication. It may be caused by server virtualization or networking delays. Server timestamp is not related with Joomla! time/timezone or User timezone. Server timestamp is universally defined as the number of seconds that have elapsed since 00:00:00 Coordinated Universal Time (UTC), Thursday, 1 January 1970. Unix time is not defined according to time zones. Read more, https://en.wikipedia.org/wiki/Unix_time. # The System Check is showing a red Timestamp difference (998), why? Concerning to Timestamp difference (998), you have disabled "Version check (Offline mode)" (Control Panel / Options / Live Update tab). In this mode, Timestamp is not checked and it just shows 998. Please, try to enable it again just to check your site Timestamp. # The System Check is showing a red Timestamp difference (999), why? Concerning to Timestamp difference (999), AutoTweet is unable to verify the timestamp. AutoTweet opens an external connection to verify the server time. Particularly, it opens a secured SSL connection, via cURL module, to Twitter servers. Please, check with your hosting provider if there is any restriction or misconfiguration to perform this basic action. # Live Update shows this error "SSL certificate problem, verify that the CA cert is OK"
This error is mainly caused by a hosting misconfiguration, validating SSL certificates. Please, ask your hosting provider to review this issue. Once your hosting can open a secure SSL connection, it will download and install the updates. You are running an outdated version of PHP (not stable), which is not supported by the extension. Most hosting providers already offer to upgrade to PHP 5.6. Please upgrade to PHP 5.6 or later as soon as possible (previous PHP versions are not longer considered stable. They don't have Bug fixes, Patches, or Security issues fixes). # Tried to upgrade from old version N, now it does not work anymore, why? What can I do? In general, if you upgrade from a recent version, no issues will be found. However, if you are upgrading from a legacy version, some problems might appear. If you find a Blank page or Error page after the upgrade, or you can not access the back-end site, please, check this FAQ to regain control. Once you access the back-end site, continue with the following steps. The installer works executing several upgrading scripts to update the site. However, due to several external factors, the upgrade might fail. In this case, we recommend to take note of your current configuration (channels, rules, and plug-ins), uninstall and install it again to clear previous settings, and be able to start over. After you uninstall and install, settings should be cleared. However, if you experience the problem again, try to uninstall and install again. This time, the new installer will be clearing the settings, and you will be ready to start over. Joomla! shows this error message when you try to update to the extension latest version. Joomla! cannot successfully download and install the file. Have you assigned the Download ID? It is required to authorize downloads. Please, click here to access your Download ID. Update from "Extension Manager: Update"
If the problem persists, we have found a minor incompatibility in the latest Joomla! installer plugin, please manually download the extension and install it to update the installer plugin and the rest of the associated files. Next time, it will be updated with no errors. # Cron created but no processing, why? To verify if the Cron job command is executing, please, enable the logging mode and check if log entries are recorded following the defined interval. If no records are added after a while, then it is not executing. In general, we recommend to execute the Native CRON script , but there are also many alternatives. Since every hosting platform has its own settings, please, ask your hosting provider what is the best way, check hosting documentation or send them the command script to verify it. Sometimes, the command line requires additional permissions or a slightly different command. # Executing in Cron job mode, posts have this domain-error-running-as-cronjob.com/home/... URL, why? When you run Autotweet in a command line context, there is no way to know the real URL domain. Base URL Override parameter must be defined to create the right URLs. # My system shows a Blank White Page. What should I do? A blank white page is an error page! Due to PHP errors, AutoTweetNG or Joocial (or any other Joomla extensions) can stop working without displaying an error, just a Blank Page. The Blank Page is caused by disabled PHP Error Reporting. This is a common security measure in production sites. Again, a white page is just an error page where the error message has been suppressed by your configuration. Once you solve the error, the site is going to be back to the normal state. Check your server error logs (not the access logs): even when PHP Errors are disabled, they may be saved in an error log file. Joomla! 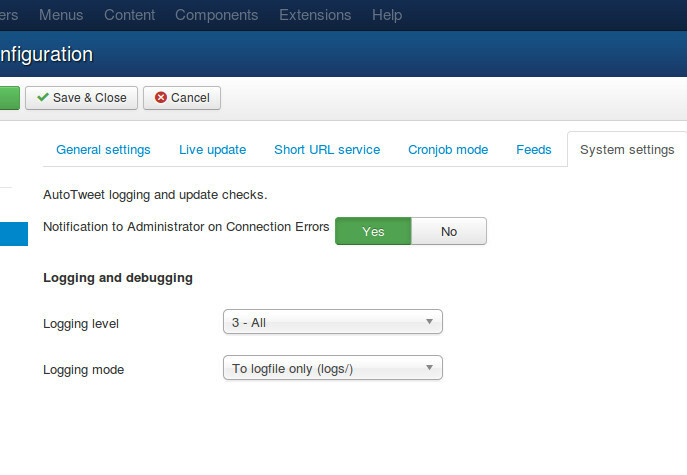 Configuration - Error Reporting: go to Joomla! Administration / Global Configuration / Server, and enable "Error Reporting" to Maximum. If your site still shows a Blank Page, your hosting provider may have restricted this setting too. Additionally, if you can't access the back-end website, check the next cases. Hosting Configuration: visit CPanel, or your hosting control panel, and try to enable PHP Error Reporting in this area. Alternatively, you can ask to your Hosting Support, how to enable it. You have installed an extension (package). Joomla! is trying to load several new system plugins, a dependency is not fulfilled or there is a PHP Error in your site. If the front end website is down, Joomla! backend may work (it does not load the same plugins). Please, try to access the backend to disable the latest installed "system" plugins. If the Joomla backend is also down, access your Database and manually disable the latest installed plugins. To disable a plugin, change the enabled column to 0. # What can I do to get my system back, if the white page persists? Rename the latest installed system plugins folders in "[Joomla_root]/plugins/system/"
Always, test new software on a development site. Always, create and check to have a recent backup at hand (test how to quickly restore it). Akeeba backup is a great component, and very easy to use. Always, if you are going to install it in your live/production site, install it at a convenient time (Eg weekend). You can also announce a downtime window to upgrade your site, and be ready for a rollback. The Logging Mode is a key tool to check the extension inner workings. It is a handy way to check component internals, beyond a simple error message. You can enable several logging modes to leave a track of server-side operations. Access the Options menu, in Components/(Extension Name) Control Panel. As a result, xt-logging.log file is generated with all operations details into logs/ directory. Please, check the file generated in logs/xt-logging.log. To check in full detail how it is executing, you can just enable the Logging mode to show 3-All To screen only, and manually Process requests or Publish Posts. xt-logging.log can be downloaded from System Check. Unable to retrieve access token. In the final step of the authorization, the user is redirected back to the site and AutoTweet has to retrieve the new access token. If AutoTweet cannot open a secure (SSL) connection to retrieve the token, then the channel authorization is not completed and the same channel state is shown. Generally, this problem is caused by a broken/outdated cURL-SSL configuration. Please, contact your hosting provider to update the installation. cURL PHP module must be enabled, with SSL support. Please, review the System Check and server requirements . Additionally, ask your hosting support to confirm the cURL PHP module configuration. This is a general PHP or Apache error. There is a problem deep in the hosting platform. Please, ask your hosting support to find out the source of the problem. Finally, Joomla! 3 and our extensions support PHP 5.4 or superior. However, PHP 5.3 and 5.4 are buggy, outdated and not longer considered stable by https://php.net/releases/ . Please, update at least to PHP 5.6 or superior. Strict Standards errors are found when "PHP suggest changes to your code which will ensure the best interoperability and forward compatibility of your code". As Joomla! and AutoTweet are ready to be run with PHP 5.3, or superior. Each version can report different "suggestions". Please, disable Strict Standards notices in your hosting, or ask your hosting support to disable them. Social APIs only allow clients to make a limited number of calls, in a certain time window. Thus, AutoTweet is affected by these limits when messages are published. The situation with Facebook rate limiting is much more complex and there is no real official information about this by Facebook. Also, they change from time to time the rate limiting without announcements. # Error "Couldn't resolve host", what does it mean? These messages indicate that your webserver has a problem looking up the IP address of the destination server or it is unable to open the connection. Networking problems: a trouble connecting to external address. Security restrictions: hosting policy has to allow external connections. Problems with your hosting company network: DNS service on other DNS servers at your hosting company server-network or general internet connection problems. Problems with public DNS services: general DNS replication problems. Problems at the destination server end: Occasionally, social networks servers have these very same issues. Just in case, wait for 3-4 hours to verify if the error is solved on the other side. In any case, your hosting provider has the tool to diagnose and solve the issue. Please, check with your hosting support. Joocial and AutoTweetNG are tested to work with the Greek alphabet, and any non-latin characters. In addition, please update to the latest extension version. # There is a difference in server time. How do I fix this? If the server clock is going out of time, please, contact your hosting support to fix the clock synchronization. Server time zone: It is generally defined as UTC/GMT by your hosting provider. Joomla! time zone: Defined in System/ Global Configuration/ Location Settings/ Server Time Zone. This setting defines the date/time shown at Joomla CMS level (independently from server time zone). User time zone: Some extensions allow to define a user timezone (independently from Joomla! time zone). AutoTweet shows and process information according to Joomla timezone. Please, check if there is any mismatch between your time definition and the configured time zones. Joomla! 3 runs on jQuery. However, legacy extensions may load MooTools and other libraries (for example Dojo), or load multiple jQuery versions - jQuery must be loaded only once -. Check and isolate scripts to simplify page loading.